Hi Friends, we are officially 3 weeks into Project 1 Room 30 Days (Hosted by my sweet friend Alaya at Behind the Big Green Door.) 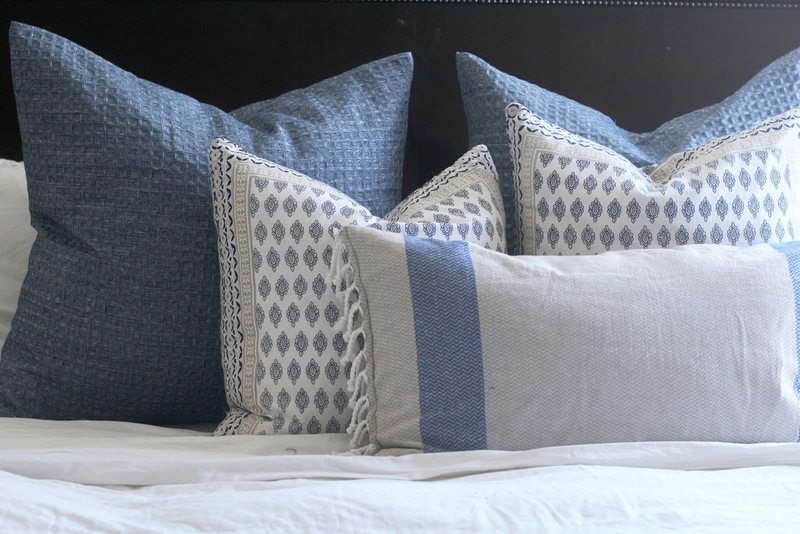 So far, I've shared with you, my inspiration pics, my throw pillows and my bedding choices. I am feeling pretty good about my progress, so my goal this week was to find euro covers, curtains, lamps and a rug. Since I got a bit behind, I had to really make this week count! I searched high and low for affordable euro covers to no avail! I found a few euro pillows with interesting covers, but, at $30 a pop, I wasn't interested, besides I really didn't need extra pillows. I ventured to Target and came across this shower curtain. While it wasn't a graphic print that I had hoped for, I really liked the texture and color of it, as it coordinated nicely with my dish towel fringe and cloth napkin pillow covers, that I made last week, plus it was on clearance. 1 shower curtain was perfect for 2 euro covers. I love thinking outside of the box when it comes to finding fabric. Besides, the fabric store gives me ridiculous anxiety, please tell me I'm not the only one? Because I haven't ventured into sewing zippers quite yet, I made the euro covers my favorite way, envelope style and I love how they came out. I'll share a tutorial soon. 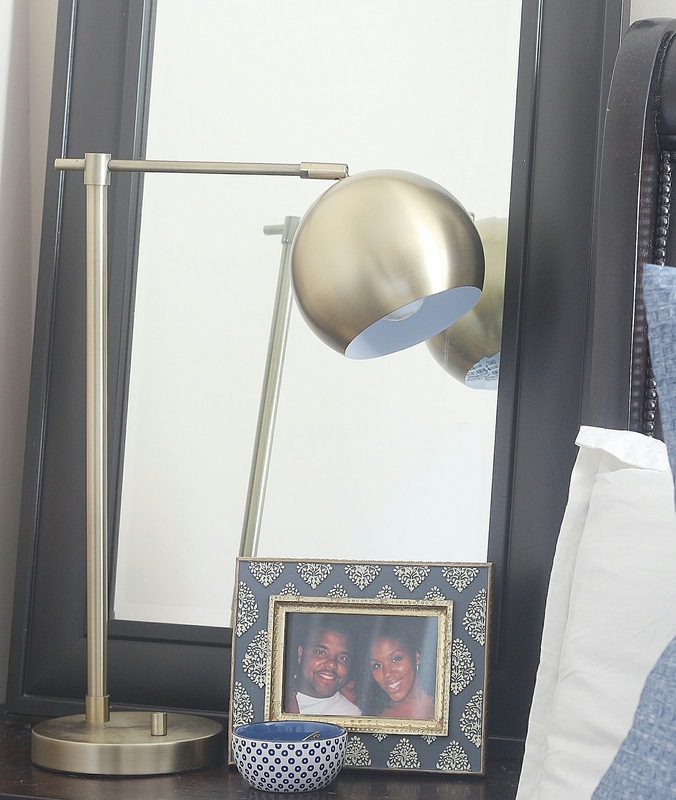 I knew based on my inspiration pics that I wanted some sort of cantilever type lamp for my side of the bed. For my hubby's side, if it weren't for aesthetics, he could go without, because he never uses a lamp on his side of the bed anyway. After trying a few different lamps, this one, that I thrifted a while ago, fit the bill perfectly! The scale was just what I needed, it just needs a little makeover. 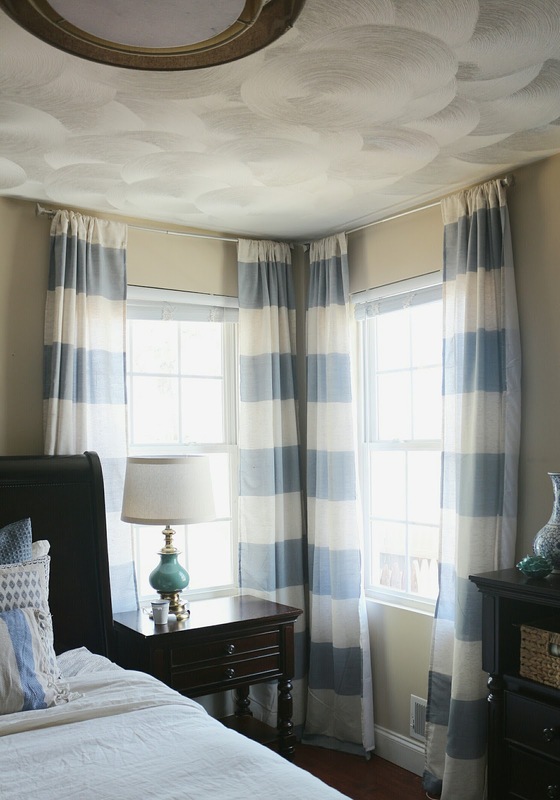 The ceiling light is a modern drum shade which I'm debating on switching out, for another drum shade/chandelier that I already have on hand, I just haven't decided if I feel like changing it or not. 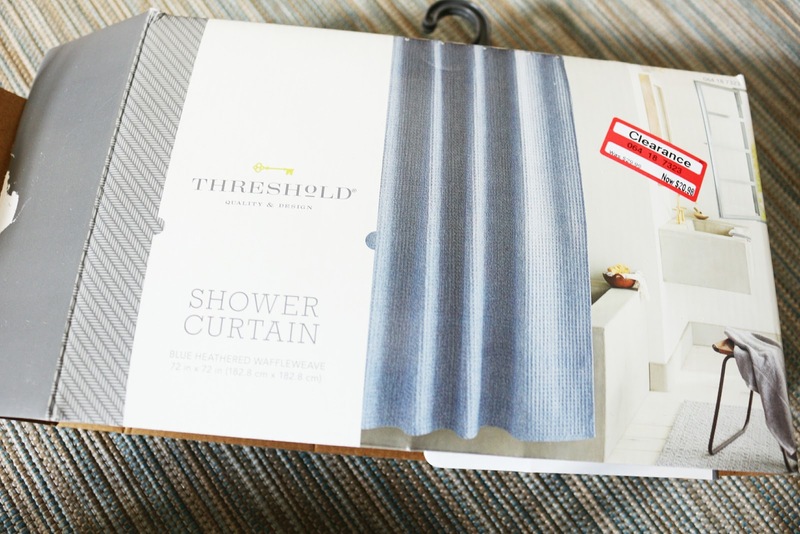 I just love purchasing window treatments at TJ Maxx or Homegoods. They always have the perfect length, with a very decent selection! I saw these striped ones and felt that they coordinated perfectly. When I put them up, I wasn't sure if they were too matchy-matchy, but they've definitely grown on me, they are the same style as the one's I have in my dining area. 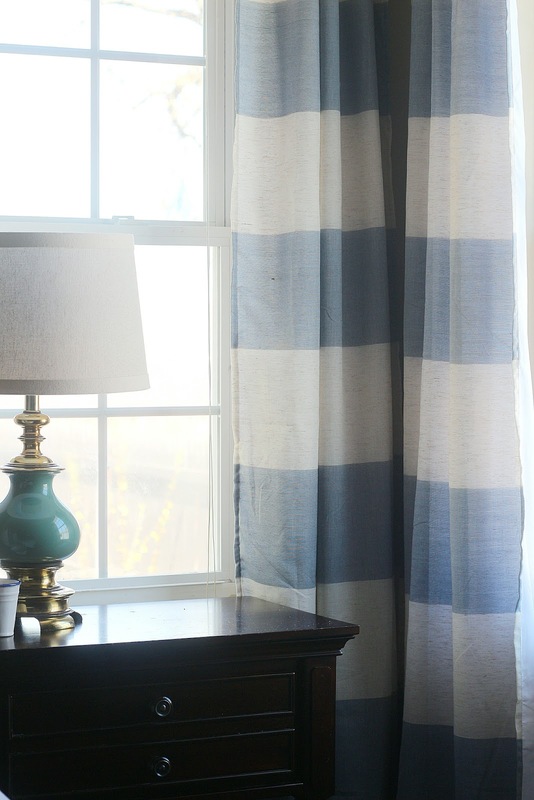 I'd like to change out the blinds for roman shades, and I'll probably change out the curtain rods as well. So what do you think? I feel like I've put a pretty good dent in this project this week, I'm feeling good! Coming along so nicely Carli. Cant wait to see if all done! Amazing Carli! 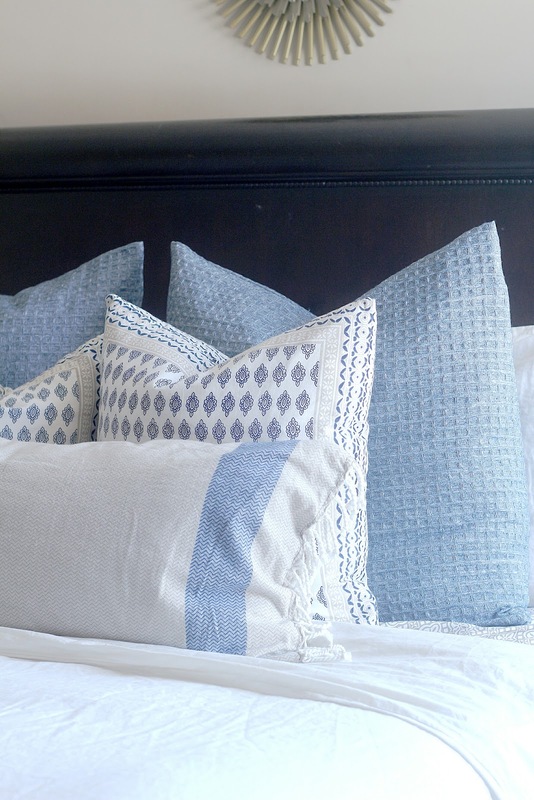 I'm loving the blue, so serene and calming for a bedroom!